YWCA of the City of New York is dedicated to eliminating racism, empowering women and promoting peace, justice, freedom and dignity for all. As a member of the senior team, focused on developing sustainable support for the YWCA of the City of New York, the Director of Institutional Giving will report to the CEO and work closely with the Chief Operating Officer, Chief Program Officer, the Senior Manager of Communications, and organization leadership, to drive fundraising efforts. This individual will be tasked with implementing the infrastructure required for developing sustained annual stewardship and support. Must have demonstrated fundraising capabilities and a hands-on, can-do approach to fundraising. The Director of Institutional Giving will also help the organization’s leaders, staff and board members to integrate a fundraising perspective into all aspects of the YWCA’s programs and operations. 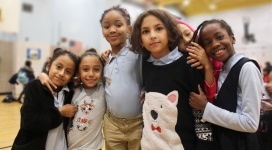 • Thoroughly understand and articulate the values, history, traditions, communities, programs, and governance structure of the YWCA of the City of New York; understand its base of financial support and the short and long-term funding requirements. • Work in close partnership with the COO to ensure programs have the financial and internal resources needed. This may include but is not limited to identifying funding sources, securing new streams of income, supporting efforts to connect donors to programs, working with the Sr. Communications Manager to ensure proper and effective marketing materials, social media presence, and website content is updated and timely refreshed. • Spearhead the development, communication, and implementation of effective growth strategies and processes for institutional fundraising. • Develop strong relationships with key funders, board members, staff, influencers, and community members. • Evaluate current processes and systems that support fundraising initiatives and donor recognition; and, with the Sr. Communications Manager, ensure that information systems are scaled to need and are properly managed. • Establish clear standards for stewardship, donor recognition, and institutional sponsorship. • Collaborate with the senior leadership of the YWCA in the preparation of annual operating plans and budgets, incorporating fundraising projections into the budget of the organization and developing key risk indicators. • The candidate must be highly organized with ability to implement systems and follow-up processes, ability to work under pressure, demonstrate sound independent judgment, and produce a quality work product within tight time constraints. • Responsible for writing proposals for both unrestricted operating revenue and restricted projects and for submitting timely and accurate reports for all existing grant funded projects. • Ensure successful adherence to grant and restricted giving agreements; and prepare, facilitate and manage grant/foundation and donor reporting requirements. • Establish an institutional giving program that encompasses multiple revenue streams including, sponsorships, corporate gifts, and foundation solicitations for restricted and unrestricted giving. • Research and identify prospects, funding opportunities and new program areas. • Aggressively implement a structured program for fostering strong, long-term relationships with targeted institutional donor constituencies. • Lead development of materials (on-line and published, text and multi-media) that tell the YWCA story to donors and individual prospects, ensuring that these materials are segmented and distributed in a targeted, regular, timely and consistent fashion. • Responsible for writing city, state and federal proposals and for submitting timely and accurate reports for all existing grant funded projects. • Establish a process for tracking all grant deliverables, ensuring timely delivery of grant requirements and adherence to the giving agreements. • Identifies funding opportunities and new program areas to match organization priorities. • With the Sr. Manager of Communications, develop, maintain and implement funding calendar activities, including cultivation activities. • Develop and produce with the Sr. Communications Manager all collateral, invitations, and communications to support YWCA events, advocacy, and to increase awareness. • Support Communications in its development of social media campaign to spread the YWCA message and activities. • With the collaboration of the Communications Manager, develop, prepare and ensure timely production of the YWCA Annual Report. • Represent the organization at events, conferences and forums. • Support development of Board reports for both the Fundraising + Communication Committee and the Nominating and Board Development Committee. • Bachelor’s degree required, advanced degree preferred. • 7-10 years management experience, required. • Demonstrated success at securing five-, six- and seven-figure gifts. • Experience with establishing giving programs, grants management systems, and working with a board of trustees is valued. • Experience in communications, marketing or external affairs is valued. • Familiarity with the New York City funding landscape, and with securing City funding is a plus. • Strong organizational skills and analytical ability. • Solid computer skills; Microsoft Office Suite, internet research, and fundraising/relationship management database. • Strong work ethic and professional values. • Ability to handle a variety of constituencies, manage multiple tasks simultaneously and thrive in a complex environment with multiple priorities. • Commitment to promoting YWCA’s social justice mission, educational and youth development philosophy. • Support the YWCA CEO & COO in various ad hoc projects.